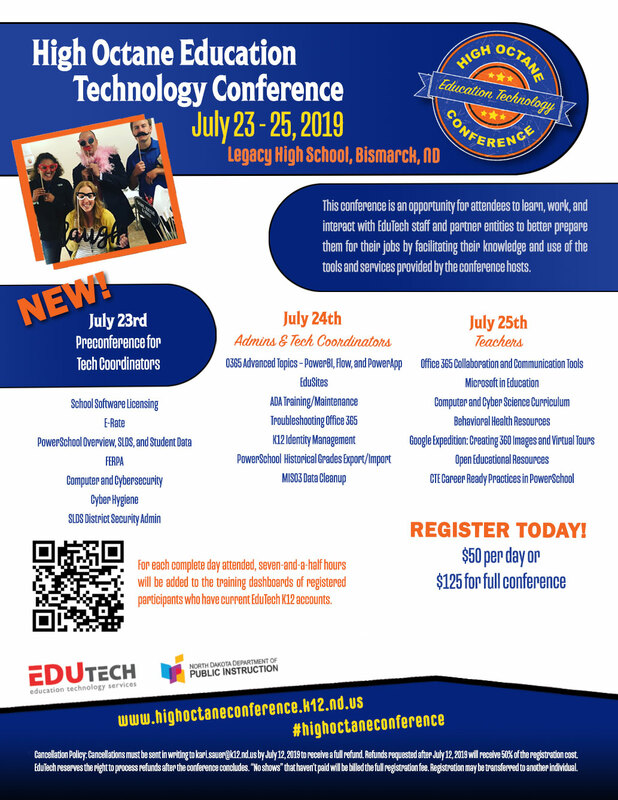 The third annual High Octane Education Technology Conference will be held on July 23-25, 2019 at the Legacy High School in Bismarck, ND. This conference brings together administrators, technology coordinators, and teachers. It provides opportunities for attendees to learn, work, and interact with EduTech staff and partner entities to better prepare them for their jobs by facilitating their knowledge and use of the tools and services provided by the conference hosts. Tuesday, July 23 is a preconference for technology coordinators. This day will focus solely on getting new Technology Coordinators up and running FAST. This will also be a great refresher course for current Technology Coordinators. 2) Wednesday, July 24 will focus on Administrators and Technology Coordinators. 3) Thursday, July 25 will concentrate on teachers. Lunch and refreshments will be provided. Cost of the conference is $50 per day or $125 for full conference. Register TODAY! Check out the promotional flier for the event! Follow #highoctaneconference on social media. For each complete day attended, seven-and-a-half hours will be added to the training dashboards of registered participants who have current EduTech K12 accounts. Please follow the NDSU Professional Development Credit Information link for more details about credit. Designed to support middle and high school teachers before and during their first year teaching Computer Science Discoveries or Computer Science Principles, the Code.org Professional Learning Program begins with a five-day, in-person summer workshop at the Microsoft Campus in Fargo, ND on June 17-21, 2019. This is followed by four additional sessions throughout the year. No previous experience teaching computer science is required. In addition to attending a five-day summer workshop, the professional learning program includes up to four required one-day, in-person workshops during the 2019-20 school year. Applications are currently open for middle and high school teachers. Learn more and apply for the 2019 Professional Learning Program. We have full scholarships available for all North Dakota teachers for the 2019-20 school year! That means you can attend this $3,000 professional learning program at no cost to you or your school thanks to our generous supporter, Code.org. The scholarship covers your teaching materials, workshop supplies, nine days of professional development, and meals during workshops. Additional travel costs, lodging, and evening meals are not covered. The curriculum, online student learning platform, and year-round support are available to you and your school at no charge. That’s a BIG deal! This workshop is a compilation of some of the most popular Augmented Reality apps and Web sites used in education. Learn what Augmented Reality is and how to use these many resources to bring the classroom to life. Participants will submit a video assignment for this workshop; a recording of you using one of the Augmented Reality tools in the classroom. This workshop is designed to guide participants through the basic setup of a website using EduSites. It is for beginners and anyone new to website creation, WordPress or EduSites. You will prepare your site and learn how to create web pages, add text, documents, links, pictures and videos. Do you want to dive deeper into how Office 365 can assist you in your classroom? This workshop will extend our Office 365 introductory workshop and demonstrate even more ways to use the following tools: OneDrive for Business, People, Calendar, Mail, OneNote Class Notebook, and the use of Office 365 on Mobile Devices. File management and collaboration techniques will also be examined in closer detail. Explore the possibilities of your new Office 365 account in your school! This class will provide participants with basic knowledge of their new Office 365 account. This class provides an overview of Outlook, Calendar, People, OneDrive and Lync. This class will provide participants with the knowledge to utilize OneDrive to store, edit, and share documents with staff and students for online collaboration.